I prefer not to try new dishes for food gatherings, but we were hosting a potluck on a Friday and that leaves little time to prepare anything fancy, so I turned to my slow cooker for guidance! I figured the easiest way to satisfy a crowd was with a massive quantity of beef, so I bought an entire eye round roast weighing in at 5.8 lbs. I chose a few favorite beef-accompanying ingredients like mushrooms, sweet onions and red wine, and took some suggestions from others to create the all-around-perfect beef dish. It reminds me of an album from the group Infected Mushroom called “Converting Vegetarians”. Great album, although the name is better applied to this recipe – it’s that good. 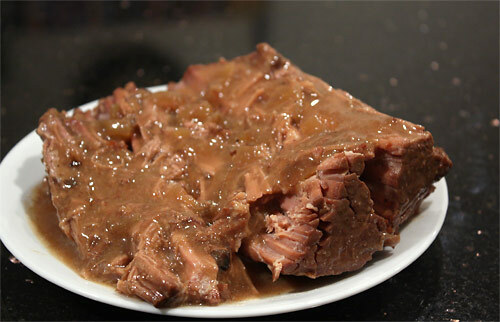 Since this is a very lean cut of meat it’s very tender but a little dry inside – which works in perfect harmony with the half gallon or so of gravy this recipe makes alongside. 1. Mix all of the ingredients, except for the beef, in a crockpot at least 5.5 quarts in size. Once they are well mixed, place the beef in and attempt to submerge entirely in liquid. Cut the beef into 2 or more pieces if necessary. Turn on low for 8-10 hours. 2. Use tongs and a fork to pull off chunks of meat and serve. Take a large cooking spoon and cover each serving with a few spoonfuls of the gravy, carrots and onions. Leftovers can be frozen but I’ll soon share the best way to use that leftover beef. This next picture occurred after the beef in the picture above was pressed down with a spoon and smothered in gravy. Wow! That does look amazing. Makes my mouth water! OK, so I’m definitely going to fave this one and come back to it next week for dinner prep! Thanks for an awesomely easy recipe! This looks awesome and really simple. I never knew eye round was the leanest cut!! Yes maam! Eye round is only 4-5% fat (by weight). As a comparison, chicken breast is about 3.5% fat. I haven’t made one pot roast this winter. So wrong. Looks good my friend! I am not vegetarian. At all. By any means. But if I were, this would win me over. Hands down. Looks so savory and delicious! Pot roast is so comforting, I can’t see anyone disliking it! Infected Mushroom is darn good but I’m not sure how much I like the new album. They were impressive live especially for a genre such as that! That looks really good! We’ve been using our slow cooker quite a bit and this might need to be the next thing made in it. “I figured the easiest way to satisfy a crowd was with a massive quantity of beef” Hehehe, isn’t that the truth! This looks wonderful. 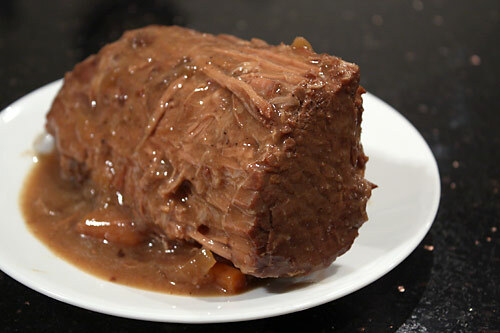 I adore my slow cooker… I really love the way that when beef is in a slow cooker, it just seems to MELT! Falls apart in your mouth as you’re eating it. Mmmmmm. Haha. Even people that aren’t huge fans of beef seem to gravitate towards a slow cooked beef. When it’s that tender it’s not really like meat anymore, it’s like like complete and total ecstasy for the tongue! I love using a slow cooker, and its a great tool to have for pot lucks! This looks delicious for a cold winter’s day gathering!